The feelings that members of America’s religious groups have about one another run from warm to neutral to cold, but some of the chilliest attitudes found in a new Pew Research Center survey were between evangelicals and atheists. We asked Americans to rate eight religious groups on a “feeling thermometer” from 0 to 100, with higher numbers indicating warmer, more positive feelings and lower numbers indicating colder, more negative feelings. On average, Catholics give atheists a rating of 38, and Protestants give them a frosty 32 – lower than either group’s ratings for Buddhists, Hindus, Jews, Mormons or Muslims. White evangelical Protestants express particularly cold feelings toward atheists, with an average thermometer reading of 25. For their part, atheists are similarly chilly toward evangelical Christians, who receive an average rating of 28 from atheists. (Respondents were asked to rate “evangelical Christians” on the feeling thermometer. White evangelical Protestants analyzed here are a subset of this group.) Overall, atheists express somewhat more positive feelings toward Catholics (47). 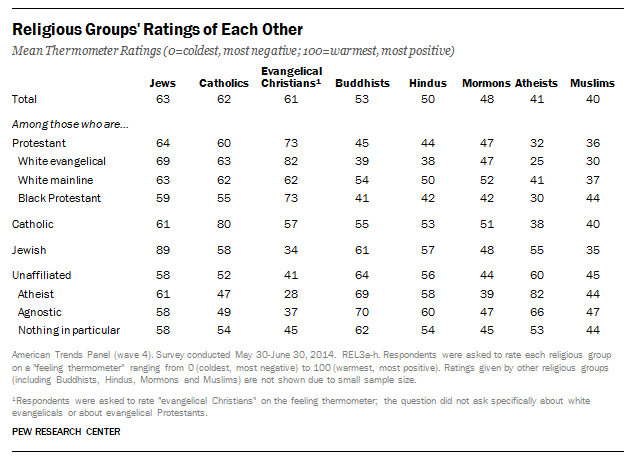 Atheists give Hindus a relatively warm rating of 58, Jews a 61 and Buddhists a toasty 69. Granted, these groups are, like atheists, small minorities in the United States, and atheists may feel especially close to Buddhism because it often is viewed as a nontheistic religion that does not require belief in a divine creator. Some mutual warmth between atheists and Jews also is apparent: While atheists give Jews a 61, Jews give atheists a 55 – the warmest rating that atheists get from any group other than agnostics, those who claim no particular religion and atheists themselves. When Americans consider religious groups other than their own, Jews receive the warmest overall ratings – an average of 63 – followed by a 58 rating of Catholics by all non-Catholics. One-in-ten Americans (10%) rate Jews coldly (33 or below), which is lower than the percentage who give similarly cold ratings to all of the other groups. Among all the religious groups in the survey, white evangelical Protestants express some of the most positive feelings toward Jews, an average rating of 69. The feeling, however, is not mutual. Jews give evangelical Christians a 34 – among the lowest they give any group. Evangelicals’ positive feelings toward Jews may not be surprising, given the role of Judaism in the history of Christianity and the place of Jews in the Bible. Born-again or evangelical Christians tend to express a strong belief in the Bible as the word of God, and in a survey we conducted last year, a substantial majority of white evangelicals (82%) said that God gave the land of Israel to the Jewish people. The reasons for Jews’ relatively cold feelings toward evangelicals are not as clear. Possible explanations could include differences over proselytism (evangelicals often seek converts, while Jews traditionally do not), separation of church and state, and politics in general (evangelicals tend to be conservative, while U.S. Jews are mostly liberal).